John H. Tilelli John Tilelli Jr.
As tensions on the Korean peninsula rise after an international investigation found that North Korea was responsible for the sinking of a South Korean warship, a Council on Foreign Relations (CFR) Independent Task Force warns that North Korea's continued provocations pose a serious threat to its neighbors and that its nuclear weapons program must be stopped. "The United States must seek to resolve rather than simply manage the challenge posed by a nuclear North Korea," asserts the Task Force. 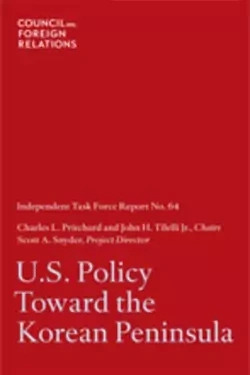 In its report, U.S. Policy Toward the Korean Peninsula, the Task Force emphasizes that "despite the difficulty of the challenge, the danger posed by North Korea is sufficiently severe, and the costs of inaction and acquiescence so high, that the United States and its partners must continue to press for denuclearization." The United States cannot risk "the potential spread of nuclear weapons to rogue states, terrorist groups or others--especially in the Middle East." The Task Force says that the United States also must provide leadership with its regional partners to "coordinate actions designed to contain the spillover effects of possible North Korean instability while insisting that North Korea give up its destabilizing course of action." It recommends that contingency planning be prioritized: "Given the uncertainties and associated risks related to North Korea's future, it is necessary and sensible for its neighbors to consider the possibility of volatility in North Korea and plan for its possible effects." The bipartisan Task Force, chaired by former special envoy for negotiations with North Korea Charles L. "Jack" Pritchard and former commander of UN Command/U.S. Forces Korea John H. Tilelli Jr., and directed by CFR Adjunct Senior Fellow Scott A. Snyder, is comprised of roughly two dozen distinguished experts representing a wide variety of backgrounds. The report commends the U.S.-South Korean partnership and applauds the close alliance coordination following the ship incident. The Task Force urges the passage of the South Korea-U.S. Free Trade Agreement, which it says is good for America and would send a strong message of support for South Korea. While each member of the Six Party talks--China, Japan, North Korea, Russia, South Korea, and the United States--has its own concerns, "any hope of resolving the North Korean standoff will depend on all parties cooperating with one another and being firm with North Korea." The report emphasizes that "Chinese cooperation is essential to the success of denuclearization on the Korean peninsula and to ensuring regional stability." The report makes several specific recommendations, including calling for the establishment of a dialogue with China about the future of the Korean peninsula, bilateral talks with North Korea regarding missile development, and close consultations with allies South Korea and Japan. The report recommends that the Obama administration prioritize its approach to North Korea in the following order. Prevent horizontal proliferation: "The United States and its allies should heighten vigilance against the possibility of a transfer of nuclear weapons technologies or fissile material from North Korea and strengthen the capacity to carry out effective counterproliferation measures." Stop vertical proliferation: "North Korea's unconstrained efforts to develop a missile delivery capability for its nuclear arsenal would dramatically expand its ability to threaten its neighbors and further complicate prospects for reversing its nuclear program." Denuclearize: "The debate over nonproliferation versus denuclearization is a false choice; the United States and its partners can and must do both by containing proliferation while also pressing for denuclearization." The Task Force recommends that the United States seek ways to integrate North Korea into the international community, including through cultural and academic exchanges. "The Obama administration should change long-standing U.S. policies blocking North Korea's participation in activities of international financial institutions," notes the report. It also condemns North Korea's abysmal human rights record: "North Korea's shameful human rights situation and failure to meet the needs of its people is a human tragedy that should be addressed by U.S. humanitarian assistance and other measures to improve human rights conditions inside North Korea." Educators: Access Teaching Notes for U.S. Policy Toward the Korean Peninsula. Michael R. Auslin is a resident scholar in foreign and defense policy studies and director of Japan studies at the American Enterprise Insti­tute for Public Policy Research. Auslin specializes in U.S.-Asia rela­tions, U.S. security policy, and Asian maritime security. Auslin was an associate professor of history at Yale University and senior research fellow at Yale's MacMillan Center for International and Area Studies prior to joining AEI. He has been named a Young Global Leader by the World Economic Forum, a Marshall memorial fellow by the German Marshall Fund, an Asia 21 fellow by the Asia Society, and a Fulbright and Japan Foundation scholar. His writings include the award-winning book Negotiating with Imperialism: The Unequal Treaties and the Culture of Japanese Diplomacy and the report Securing Freedom: The U.S.-Japa­nese Alliance in a New Era. His new history of U.S.-Japan relations will be published in 2011. A columnist for the Wall Street Journal, he appears regularly in U.S. and foreign media commenting on current Asia issues. Auslin graduated with honors from Georgetown University's School of Foreign Service and was awarded a PhD in history from the University of Illinois at Urbana-Champaign. Douglas K. Bereuter is the president and CEO of the Asia Founda­tion, headquartered in San Francisco. Immediately before this position he served for twenty-six years in the U.S. House of Representatives. He served for twenty years on the House Foreign Affairs Committee, was its vice chairman for six years, chaired the Asia-Pacific subcommittee for the six-year maximum, chaired the Europe subcommittee immedi­ately before leaving Congress, served on the Human Rights subcom­mittee for six years, and had a long tenure on the Economic Policy and Trade subcommittee. Bereuter was a longtime member of the House delegation to the NATO Parliamentary Assembly, and served as its pres­ident. He also served nearly ten years on the House Permanent Select Committee on Intelligence, retiring as its vice chairman. Bereuter is a member of the Council on Foreign Relations and the Pacific Council on International Policy. Victor D. Cha holds the D. S. Song chair in government and Asian studies at Georgetown University. He is concurrently a senior adviser and the Korea chair at the Center for Strategic and International Stud­ies. Cha is a former two-time Fulbright scholar, John M. Olin fellow at Harvard, and Hoover national fellow at Stanford University. He has authored three books, including Nuclear North Korea with David Kang. Cha served on the National Security Council staff from 2004 to 2007 and was the U.S. deputy head of delegation for the Six Party Talks. Charles B. Curtis is president emeritus and board member of the Nuclear Threat Initiative and senior adviser at the Center for Strate­gic and International Studies. Curtis served for nine years as president and chief executive officer of NTI. Before joining NTI, Curtis served as the executive vice president and chief operating officer of the United Nations Foundation and was a partner in Hogan & Hartson, a Wash­ington, DC-based law firm with domestic and international offices. Curtis served as undersecretary and, later, deputy secretary of the U.S. Department of Energy from February 1994 to May 1997. He was chief operating officer of the department and, among other duties, had direct programmatic responsibility for all of the department's energy, science, technology, and national security programs. Curtis is a lawyer with over fifteen years' practice experience and more than eighteen years in gov­ernment service. He was a founding partner of the Washington, DC, law firm Van Ness Feldman. Curtis served as chairman of the Federal Energy Regulatory Commission from 1977 to 1981 and has held posi­tions on the staff of the U.S. House of Representatives, the U.S. Depart­ment of the Treasury, and the Securities and Exchange Commission. He is a current member of the Council on Foreign Relations. Nicholas Eberstadtholds the Henry Wendt chair in political econ­omy at the American Enterprise Institute and is senior adviser to the National Bureau of Asian Research. He is, among else, a member of the advisory council for the Korea Economic Institute and of the board of directors for the U.S. Committee for Human Rights in North Korea. He has written extensively on issues in demography, development, and international security, and has published hundreds of articles or studies and written or coauthored nearly twenty books, monographs, or edited volumes. His most recent books on North Korea are The North Korean Economy: Between Crisis and Catastrophe and Policy and Economic Per­formance in Divided Korea during the Cold War Era: 1945-1991. Eberstadt earned his AB, MPA, and PhD from Harvard University, and his MSc from the London School of Economics. Robert L. Gallucci became president of the John D. and Catherine T. MacArthur Foundation on July 1, 2009. Previously, he served for thirteen years as dean of Georgetown University's Edmund A. Walsh School of Foreign Service. He completed twenty-one years of govern­ment service, serving since August 1994 with the U.S. Department of State as ambassador at large. In March 1998, the Department of State announced his appointment as special envoy to deal with the threat posed by the proliferation of ballistic missiles and weapons of mass destruction. He held this position, concurrent with his appointment as dean, until January 2001. Gallucci earned a bachelor's degree from the State University of New York at Stony Brook, followed by a master's and doctorate in politics from Brandeis University. Before joining the State Department, he taught at Swarthmore College, the Johns Hop­kins School of Advanced International Studies, and Georgetown Uni­versity. He has authored a number of publications on political-military issues, including Neither Peace Nor Honor: The Politics of American Military Policy in Vietnam and Going Critical: The First North Korean Nuclear Crisis with Joel S. Wit and Daniel Poneman. For Going Criti­cal, he was the recipient of the 2005 Douglas Dillon Award given by the American Academy of Diplomacy for a book of distinction in the practice of diplomacy. Michael J. Green is senior adviser and Japan chair at the Center for Stra­tegic and International Studies and associate professor at the Edmund A. Walsh School of Foreign Service at Georgetown University. He served on the National Security Council staff from 2001 through 2005 as director for Asian affairs and then special assistant to the president for national security affairs and senior director for Asian affairs. From 1997 to 2001 he was Olin senior fellow for Asian security studies at the Council on Foreign Relations, where he also directed CFR's Indepen­dent Task Force on Korea. He has also held positions at the Institute for Defense Analyses and the Office of the Secretary of Defense, and on the faculty of the Johns Hopkins School of Advanced International Studies, where he completed his doctoral work. He is vice chair of the congres­sionally mandated U.S.-Japan Friendship Commission, a member of the Council on Foreign Relations and the Aspen Strategy Group, and he sits on the advisory boards of the Center for a New American Secu­rity, Peacewinds, and the Australia-America Leadership Dialogue. Stephan Haggard is the Lawrence and Sallye Krause professor at the Graduate School of International Relations and Pacific Studies, Uni­versity of California, San Diego, and director of the Korea-Pacific pro­gram there. He is the author, with Marcus Noland, of Famine in North Korea: Markets, Aid, and Reform and Witness to Transformation: Refugee Insights on North Korea. Siegfried S. Hecker is codirector of the Stanford University Center for International Security and Cooperation, senior fellow of the Free­man Spogli Institute for International Studies, and research profes­sor in the department of management science and engineering. He is also director emeritus at the Los Alamos National Laboratory, where he served as director from 1986 to 1997 and as senior fellow until July 2005. He received his BS, MS, and PhD degrees in metallurgy from Case Western Reserve University. His current professional inter­ests include plutonium research, nuclear weapons policy, coopera­tive nuclear threat reduction with the Russian nuclear complex, and global nonproliferation and counterterrorism. Hecker is a member of the National Academy of Engineering and a foreign member of the Russian Academy of Sciences. He is also a member of the Coun­cil on Foreign Relations, fellow of the American Physical Society, the American Academy of Arts and Sciences, the American Association for the Advancement of Science, the Metallurgical Society, and ASM International, and an honorary member of the American Ceramics Society. Among other awards, he received the Presidential Enrico Fermi Award, the Los Alamos National Laboratory Medal, the U.S. Department of Energy's E.O. Lawrence Award, and the American Nuclear Society Seaborg Award. Fred C. Iklé is a distinguished scholar at the Center for Strategic and International Studies. He is a member of the Defense Policy Board, a governor of the Smith Richardson Foundation, and a director of the U.S. Committee for Human Rights in North Korea. Iklé was under­secretary of defense for policy during the first and second Reagan administrations. From 1979 to 1980, he served as coordinator of Gov­ernor Ronald Reagan's foreign policy advisers. From 1973 to 1977, he served presidents Nixon and Ford as director of the U.S. Arms Control and Disarmament Agency. From 1964 to 1967, Iklé was a professor of political science at the Massachusetts Institute of Technology. He has held positions with the RAND Corporation and the Bureau of Applied Social Research at Columbia University. His many publications include Annihilation from Within, Every War Must End, and How Nations Negoti­ate. In 1987, Iklé received the highest civilian award of the Department of Defense, the Distinguished Public Service Medal, and in 1988 was awarded the Bronze Palm. Charles Jonesjoined Lockheed Martin in June 2005, where he is cur­rently the director for corporate international business development in South and Central Asia. Just prior to joining Lockheed Martin, Jones served as the deputy director of the Pentagon's tsunami relief task force. From January 2004 to January 2005, he served as director for Asia on the National Security Council with responsibility for Japan, Austra­lia, New Zealand, North Korea, and the Republic of Korea (ROK). A career Department of Defense civil servant, he came to the National Security Council from the Office of the Secretary of Defense, where he was country director for Korea, responsible for the realignment of U.S. forces based in the ROK. Prior to that assignment, Jones was the senior policy and plans analyst for Northeast Asia in the Defense Prisoner of War/Missing Personnel Office, where he participated in negotiations for access by U.S. teams looking for the remains of American military personnel in North Korea. In that capacity, he traveled to North Korea on several occasions, which included a monthlong tour as liaison officer in Pyongyang for the recovery teams. William J. Lennox Jr.of Alexandria, Virginia, retired in June 2006 after a thirty-five-year career in the U.S. Army. He retired as the fifty-sixth superintendent of the U.S. Military Academy. His service included commands at every level of field artillery. His staff positions included tours as a White House fellow and as a special assistant to the secretary of the army. He also served as assistant chief of staff, CJ-3, Combined Forces Command/United States Forces Korea and deputy command­ing general, Eighth U.S. Army, and as the army's chief of legislative liaison. In addition to his BS from the U.S. Military Academy, General Lennox holds an MA and a PhD in literature from Princeton University. His military education includes the Senior Service College fellowship at Harvard University. General Lennox's awards include the Defense Distinguished Service Medal, the Distinguished Service Medal with Oak Leaf Cluster, the French Legion of Honor, and the Korean Order of Military Merit, Inheon Medal. General Lennox currently serves as senior vice president, Washington, for Goodrich Corporation, a For­tune 500 aerospace firm. Marcus Noland is deputy director and senior fellow at the Peter G. Peterson Institute for International Economics and a senior fellow at the East-West Center. He was a senior economist at the Council of Eco­nomic Advisers in the Executive Office of the President of the United States, and has held research or teaching positions at Yale University, the Johns Hopkins University, the University of Southern California, Tokyo University, Saitama University (now the National Graduate Institute for Policy Studies), the University of Ghana, and the Korea Development Institute. Noland has authored, coauthored, or edited numerous books including Korea After Kim Jong-il, Economic Integra­tion of the Korean Peninsula, and Famine in North Korea: Markets, Aid, and Reform (with Stephan Haggard). His book Avoiding the Apocalypse: The Future of the Two Koreas won the prestigious Ohira Memorial Prize. In addition to these books he has written many scholarly articles on international economics, U.S. trade policy, and the economies of the Asia-Pacific region. He has served as an occasional consultant to orga­nizations such as the World Bank and the National Intelligence Coun­cil, and has testified before the U.S. Congress on numerous occasions. Don Oberdorfer is a distinguished journalist in residence and adjunct professor of international relations at the Johns Hopkins School of Advanced International Studies. In September 2006, he was named chairman of the U.S.-Korea Institute at SAIS. Oberdorfer was a jour­nalist for thirty-eight years, twenty-five of them for the Washington Post. He has also reported for the Charlotte Observer, the Saturday Evening Post, and Knight Newspapers. His work has won numerous awards, including the National Press Club's Edwin M. Hood Award for dip­lomatic correspondence (1981, 1988) and Georgetown University's annual Edward Weintal Prize for diplomatic reporting (1982, 1993). He retired from journalism in 1993. From 1994 to 1996 Oberdorfer served as president of Overseas Writers, and from 1986 to 1989 he chaired the advisory committee of the Washington Center of the Asia Society. He is a member of the Asia Society and the Council on Foreign Relations, and currently is program chair of the Washington Institute on Foreign Affairs. Oberdorfer graduated from Princeton University in 1952 and returned as a visiting professor in 1977, 1982, and 1986. In 1996, Princ­eton bestowed on him its Woodrow Wilson Award, given annually to an alumnus for exemplary service to the nation. Michael O'Hanlon is a senior fellow in foreign policy at the Brook­ings Institution, where he specializes in U.S. defense strategy, the use of military force, homeland security, and American foreign policy. He is also director of research in the foreign policy program at Brookings. A visiting lecturer at Princeton University and adjunct professor at Johns Hopkins University, O'Hanlon is a member of the International Institute for Strategic Studies and the Council on Foreign Relations. He was a member of the secretary of state's International Security Advisory Board in 2009 and an informal adviser to General David H. Petraeus during his 2008-2009 CENTCOM review of Mideast secu­rity strategy. Jonathan D. Pollack is professor of Asian and Pacific Studies and chairman of the Asia-Pacific Studies Group at the Naval War Col­lege. He is also a nonresident senior fellow at the Brookings Institu­tion and a research associate in the National Asia Research Program of the National Bureau of Asian Research and the Woodrow Wilson International Center for Scholars. Prior to joining the War College fac­ulty, he was affiliated with the RAND Corporation, where he served in various research and senior management capacities. He has taught at Brandeis University, the RAND Graduate School of Policy Studies, and UCLA. A specialist on East Asian international politics and security, he has published extensively on Chinese political-military strategy, U.S.­-China relations, the political and security dynamics of the Korean Pen­insula, and U.S. strategy and policy in Asia and the Pacific. He is author of, most recently, the forthcoming book No Exit: North Korea, Nuclear Weapons, and International Security. Charles L. Pritchard is the president of the Korea Economic Institute in Washington, DC. Prior to joining KEI, he was a visiting fellow at the Brookings Institution in Washington, DC, from September 2003 until February 2006. He is the author of Failed Diplomacy: The Tragic Story of How North Korea Got the Bomb. Pritchard served as ambassador and special envoy for negotiations with the Democratic People's Republic of Korea and as U.S. representative to the Korean Peninsula Energy Development Organization in the administration of President George W. Bush from April 2001 until September 2003. Previously, he served as special assistant to the president for national security affairs and as senior director for Asian affairs in the administration of President Wil­liam J. Clinton. Ambassador Pritchard obtained his BA in political sci­ence from Mercer University in Georgia and his MA in international studies from the University of Hawaii. He is also a graduate of the Japan National Institute for Defense Studies, Class 40. Pritchard retired from the U.S. Army as a colonel after twenty-eight years of service. He is the recipient of the Defense Distinguished Service Medal. Evans J.R. Revere is senior director with the Albright Stonebridge Group, where he advises clients on entry and growth strategies throughout the Asia-Pacific region, with a specific focus on Korea, China, and Japan. Previously, he was president/CEO of the Korea Society, the leading U.S. private, nonprofit organization devoted to improving U.S.-Korea relations. In 2007, he retired after a long and dis­tinguished career as an American diplomat and one of the Department of State's top Asia experts. An expert on Korea, Japan, and China, his diplomatic career included service as the principal deputy assistant secretary of state for East Asian and Pacific affairs and as deputy chief of mission and charge d'affaires of the U.S. embassy in Seoul. He has extensive experience in negotiations with the DPRK. He is fluent in Korean, Japanese, and Chinese, and is a member of the Council on Foreign Relations. Stanley Owen Roth is vice president of international government rela­tions for the Boeing Company. In this role, he amalgamates country and regional issues pertinent to Boeing's interests into a comprehen­sive view of international government affairs, and works closely with Boeing government operations to create an integrated view of U.S. and global government issues and developments. Before this appointment, he was Boeing vice president of international relations, Asia. Prior to joining Boeing in May 2001, Roth served as assistant secretary of state for Asian and Pacific affairs from August 1997 until January 2001. He was the senior government official responsible, on a daily basis, for the formulation and execution of U.S. policy for Northeast and Southeast Asia. Before this, Roth served as director of research and studies at the U.S. Institute of Peace from January 1996 through June 1997. In June 1996, while at the institute, he was asked to serve as an administration envoy to six Asian countries concerning Myanmar. Before joining the institute, Roth served as special assistant to the president and senior director for Asian affairs at the National Security Council, beginning in March 1994. Roth is a member of the Council on Foreign Relations and the Asia Society. James J. Shinn teaches at Princeton University's engineering depart­ment. From 2007 to 2008, he served as assistant secretary for Asia in the Department of Defense, where his area of policy responsibil­ity ranged from Herat to Honolulu. Before coming to the Pentagon, he was the national intelligence officer for East Asia, first at the Cen­tral Intelligence Agency and then for the director of National Intel­ligence, from 2003 to 2006. He was the senior fellow for Asia at the Council on Foreign Relations from 1993 to 1996. Shinn served in the East Asia Bureau of the State Department from 1976 to 1979 and then spent fifteen years as a manager and entrepreneur in Silicon Valley. He is a cofounder of Dialogic, which went public in 1992. Shinn earned a BA and a PhD from Princeton University and an MBA from Harvard University. Susan L. Shirk is the director of the University of California Institute on Global Conflict and Cooperation and the Ho Miu Lam professor at the Graduate School of International Relations and Pacific Studies, Univer­sity of California, San Diego. She was deputy assistant secretary of state for East Asia and the Pacific from 1997 to 2000 and leads the track-two Northeast Asia Cooperation Dialogue. She is the author of China: Frag­ile Superpower and editor of Changing Media, Changing China. Scott A. Snyder is adjunct senior fellow for Korea studies at the Coun­cil on Foreign Relations. Snyder is director of the Center for U.S.-Korea Policy and senior associate of Washington programs in the international relations program of the Asia Foundation and Pacific Forum CSIS. He lived in Seoul, South Korea, as Korea representative of the Asia Foundation from 2000 to 2004. Previously, he served as a program officer in the research and studies program of the U.S. Institute of Peace, and as acting director of the Asia Society's con­temporary affairs program. His latest monograph is China's Rise and the Two Koreas: Economics, Politics, Security. His publications include Paved with Good Intentions: The NGO Experience in North Korea, coedited with Gordon Flake, and Negotiating on the Edge: North Korean Negotiating Behavior. Snyder received a BA from Rice University and an MA from the Regional Studies-East Asia program at Harvard University. He was the recipient of a Pantech visiting fellowship at Stanford University's Shorenstein Asia-Pacific Research Center (2005-2006), received an Abe fellowship administered by the Social Sciences Research Council (1998-99), and was a Thomas G. Watson fellow at Yonsei University in South Korea (1987-88). John H. Tilelli Jr. has been a member of the Cypress International team since 2002, where he currently serves as chairman and CEO. He retired in January 2000 from the U.S. Army after more than thirty years of service. His last active duty assignment was as commander in chief of the United Nations Command, Republic of Korea/United States Combined Forces Command/United States Forces Korea. General Tilelli served as president and CEO of USO Worldwide Operations from 2000 to 2002. He commanded the largest standing joint and coalition force in the world, comprising more than 650,000 soldiers, sailors, airmen, and marines. He led the theater's campaign strategy and revitalized Korea's automated command and control and equipment modernization. He served as vice chief of staff of the army and the army's deputy chief of operations. He led the army's vision of the army of the twenty-first century and implemented reforms in acquisition and procurement. He was commander of the 1st Cavalry Division, Fort Hood, Texas. He trained, deployed, and fought with the division in Operation Desert Shield and Desert Storm. General Tilelli graduated in 1963 from Pennsylvania Military College, now Widener University, with a degree in economics. He was awarded a master's degree in administration from Lehigh University. He is a graduate of the U.S. Army War College. He received an honorary doctorate in busi­ness management from Widener University and another in law from the University of Maryland.